My best friend Rozannah and I have kids born one day apart, so we throw them a combo birthday party each year. Trying to find boy/girl theme ideas is always a bit of a challenge. 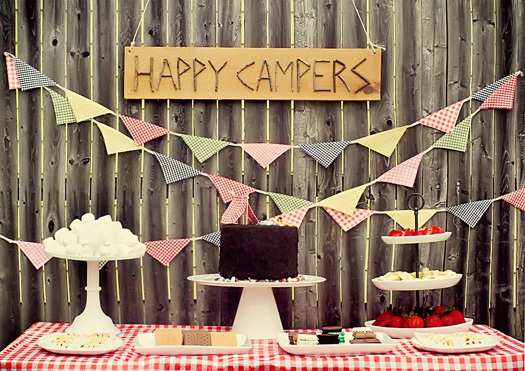 This year we went with a Camping themed 4th birthday party for Avery and Lorenzo, and the kids loved it! This Camping party was very budget friendly/DIY. 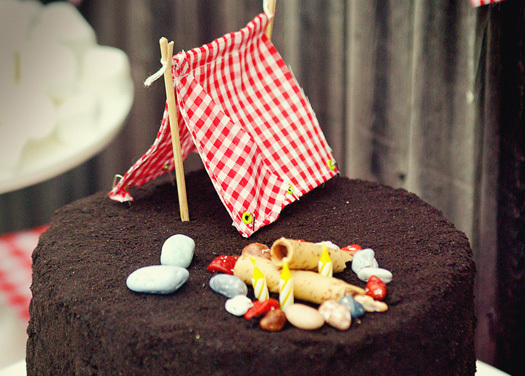 Rozannah made the ultimate chocolate peanut butter cake and the adorable camping cake decor. The tent was made of left over gingham fabric and wood kabob skewers as tent poles all secured in place with tiny grommets and bent straight pins as tent stakes. 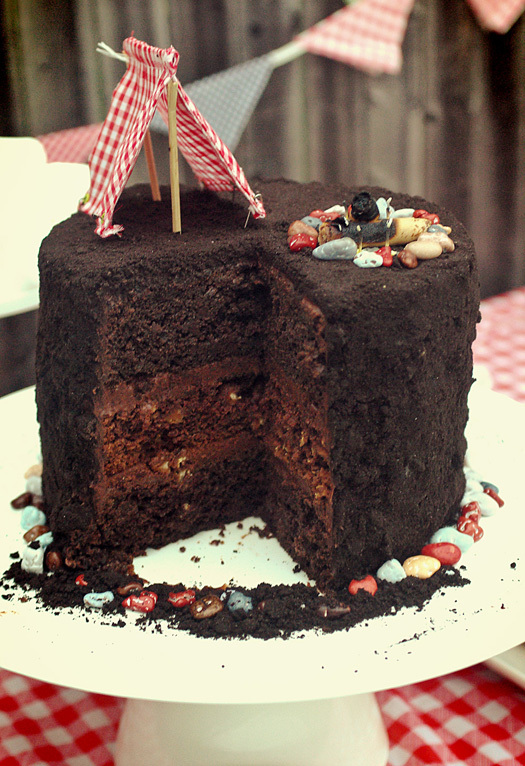 The camp fire and bottom of the cake was trimmed with chocolate rocks from Wegmans. Fire wood was made from Pepperidge Farm Pirouette Rolled Wafers. 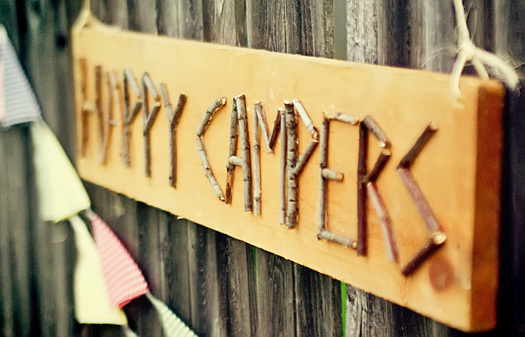 The "Happy Campers" sign was made from a scrap piece of wood and sticks collected from our yard. 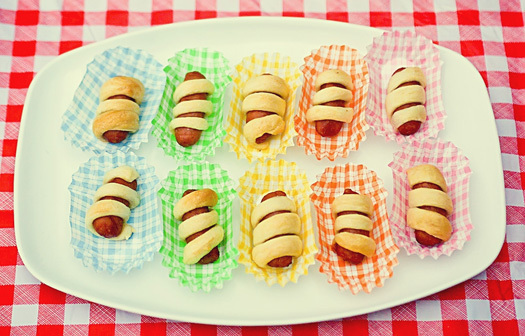 Party food included a S'mores Bar and some delicious crescent roll wrapped Lil Smokies to add something salty the mix. The kids got to build their perfect S'more with a variety of toppings. 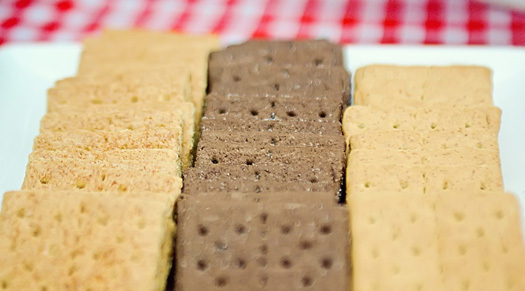 Options included Chocolate, Cinnamon and Gram Gram Crackers. Fruity options included sliced strawberries and bananas. Chocolaty options included your traditional Hershey's milk chocolate squares, and slightly more exciting choices like Reese's Peanut Butter Cups, Hershey's Cookies & Cream bars, Andes Mints, and Cadbury Caramel bars. Party Games included a super fun Nature Scavenger hunt. 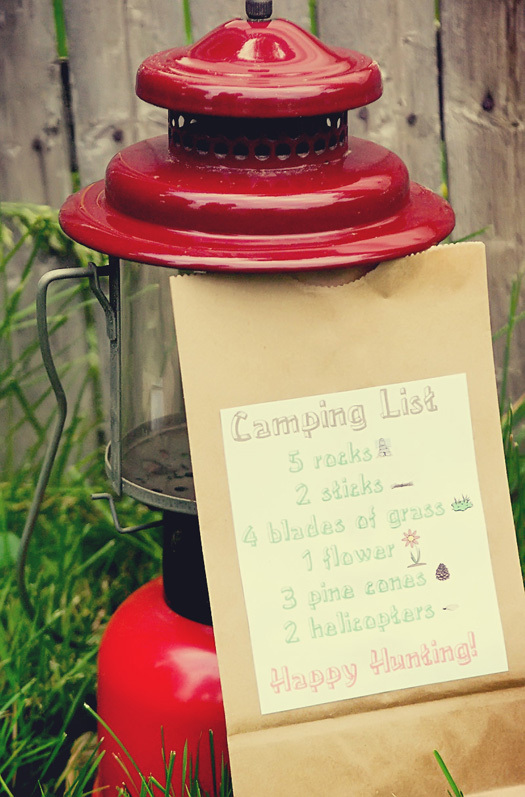 We put together a "Camping List" of outdoor items for the kids to find and glued it to paper lunch sacks. The kids had so much fun! How wonderful I am truly stocked! The cake looks amazing! 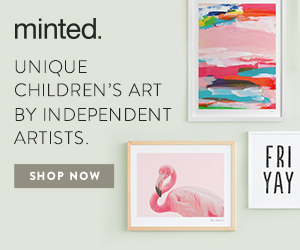 What an awesome idea and I loved the preschooler-friendly hunt list. 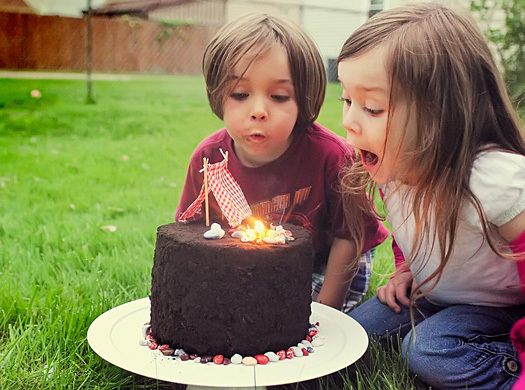 That cake is too stinkin' cute. Adorable party. I really love the "Happy Campers" sign made out of sticks. Loving the cake, too!! LOVE it! Hats off to the mom's! What cute post! I love that lantern! That cake is seriously genius! I love this! I mean really really love this! That cake!!!! How cute & clever that the birthday candles formed the "campfire"! Adorable party! May I ask where you got those gingham liners? They are adorable! The cake looks super tasty! Great job! OMG, that chocolate super cake looks amazing and delicious! can you please tell me where you got those cute mini hot dog colored papers? Where did you get those patterned hot dog holders? They're neat! This is an absolutely amazing party. WOW!! 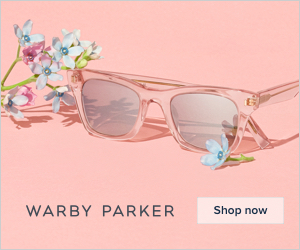 so fun and cute ! 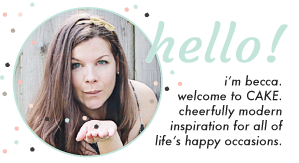 ps : love love love your blog ! please sir... may i have s'mores? here's to you harry potter.